In May, Grant UK launched a new website which incorporates the Company’s new branding while also delivering greater functionality and product information for visitors. The start of 2018 has been a busy few months for Grant UK with the expansion of its HQ in Devizes, the rebranding of its G1 installer scheme and the launch of a brand new website. To reflect the Company’s fresh restyling and to improve the user-experience for site visitors, Grant UK has developed a new website which is designed to be an engaging and informative online platform. The new site includes a number of exciting new features. In addition to the modern look, the content has been updated and a more streamlined structure has been introduced to improve site navigation. Pages are now tailored for householders and professionals, helping ensure that each visitor is accessing the product information most relevant to them. Grant UK’s new website now has a useful boiler comparison tool which will enable visitors to select up to three products, allowing them to easily compare the key features of each range. The site also has a handy product configurator which can assist householders with selecting the right heating solution for their home. Using this product selector, visitors can progress through a series of questions regarding their property’s heating needs, the answers to which will enable the configurator to suggest the Grant product range most suitable for their requirements. In addition, a comprehensive glossary and extensive FAQs feature are also new to the site, both of which share technical content and increase the level of support offered to visitors. In July, an additional feature was added to the site.Â The new online flue configuration tool is now available to access via the Professional section of Grant UK’s website. Visitors are prompted to provide details regarding the boiler they propose installing before the configurator produces its results which include the flue kit and accessories suitable for the installation. Each result is comprehensive, presenting visitors with the relevant part codes, pack content information, and important installation notices which are relevant to their search. Alongside the series of new site functions, some familiar features from Grant UKâ€™s previous website have also been transferred across. The product registration form has been simplified, the spares area has been restructured to reflect Grantâ€™s printed Spares Catalogue, the latest brochures and technical manuals for Grant’s current product portfolio continue to be available via the Downloads hub, and the Grant Events Diary details the upcoming Roadshows and Trade Events that the Sales Team are hosting. Grant UK’s redesigned website further enhances their established online offering which includes the G1 Portal platform and their apps, including the TechBox and G1 Click. Comment from Anna Wakefield, Marketing & Corporate Communications Manager for Grant “Our new website reflects the outcome of collaborative thinking between all of the Departments here at Grant UK. We have incorporated changes and new features in response to feedback from the staff who speak to our customers every day. From Sales through to Technical through to Training, Grant UK’s new look site has been designed to accommodate the needs our customers. 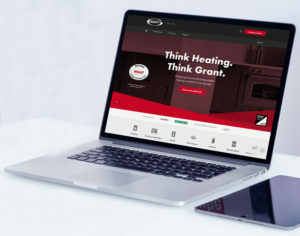 Whether a householder is in the early stages of researching a new heating system or an installer needs to check the availability of product training courses, the new website is designed to assist all. Please feel free to explore the new website and its exciting new features!